What is BCAA Xplode? Amino acids of real masters! Dietary supplement BCAA Xplode is a concentrated dose of three essential amino acids exogenous in the diet of exercisers, whose composition was supplemented with an effective amount of L-glutamine. The formulation formula has been deprived of sugar, which allows the product to be used both during the building of lean muscle mass and during weight loss. High quality of raw materials used, modern technology - this is Olimp Sport Nutrition brand warranty! Every lover of physical activity is aware of the role of protein in the diet. Proteins, in turn, are made of compounds called amino acids. An example is the BCAA complex, which consists of: leucine, isoleucine and valine. These are essential ingredients in the diet of every human being that must be supplied to the body from external sources. Although they occur naturally in food, their amounts are insufficient to cover the increased demand presented by exercising people. The BCAA Xplode formula has been supplemented with the addition of another, but equally important amino acid - L-glutamine. It is a popular component of supplements for exercising people whose task is to enhance the BCAA amino acid properties and guarantee the practitioner even more effects from the diet and many hours of training. Supplementation BCAA Xplode - how should it be used? The manufacturer's recommendations must be followed to obtain the maximum effects that can be expected from the use of BCAA Xplode . Olimp recommends taking 1 to 2 portions daily a day, which should be used during the training period, before meals or before the planned sleep. Each single dose of BCAA Xplode should be dissolved in 200 ml of cold water and consumed immediately after preparation. Price BCAA Xplode - where to buy Olimp's amino acids? Powerful help thanks to a concentrated dose of amino acids! With Xplode BCAA, you will not miss it so easily! What is in Olimp BCAA XPLODE? Dietary supplement containing a branched chain amino acid complex in the form of a powder. Contains sweeteners. Ingredients: free BCAA amino acids (30% L-leucine, 15% L-valine, 15% L-isoleucine), acidity regulators - citric acid, sodium citrate, malic acid; 10% L-glutamine, flavors, thickeners - gum arabic, xanthan gum, sodium carboxymethylcellulose; dye - E 150d (for the taste of xplosion cola); sweeteners - acesulfame K, sucralose, cyclamates (Z); anti-caking agents - calcium phosphates, silicon dioxide; emulsifier - lecithins (from soy ); 0.02% pyridoxine hydrochloride (vitamin B6), dyes - carotenes (A), cochineal (B), riboflavin (C), E 150c (D), E 150d (E), E 133 (F), patent blue V (G), indigo carmine (H), chlorophylls and chlorophyllins (I), curcumin (J), anthocyanins (K), pepper extract (L), betanin (M), vegetable carbon (N). (A) - (Z) - Depending on the taste of the product, the symbol (AZ) of the ingredient used is next to the date of minimum durability. Storage conditions: store in dry rooms, at room temperature, in tightly closed packages. Keep out of reach of small children. 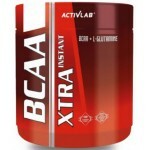 How To Use Olimp BCAA Xplode? OLIMP AMOKFood supplementIt’s a true kil.. 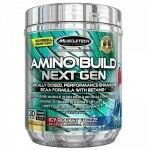 The product contains precisely select..
Amino Build Next GenClinically Dosed Per..
ActivLab BCAA XTRABCAA Xtra Activlab Ins..
ActivLab BCAA XTRA INSTANTBCAA Xtra Acti..
USN BCAA Amino GroThe all new BCAA Amino..
USN BCAA Amino BlastUSN Amino Blast is a..